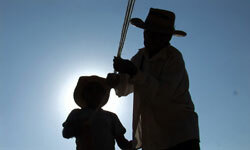 SILVESTRE PANTALEON is the story of an elderly man from the Nahuatl-speaking village of San Agustin Oapan, Mexico. It begins as a local curandero reads the protagonist's fortune in the cards and diagnoses the costly remedy to his ills: a complex series of offerings to the hearth, the ants, the river, and the deceased. Silvestre Pantaleon then struggles to pull together the money needed to pay for the curing ceremony and provide for his family, dedicating himself to the only remunerative activities he knows: handcrafting rope (made from the fibers of an agave plant) for religious ceremonies and making seldom-used household objects that he alone still has the skills to produce. SILVESTRE PANTALEON--the result of a collaboration between an anthropologist who lives Oapan and a filmmaker dedicated to working in indigenous communities--unfolds with no interviews or narration. Rather, scenes from daily life are woven together in rich ethnographic detail and lingering imagery that explore a rural community situated in the shadow of a highway bridge to the international resort of Acapulco. Over this bridge pass thousands of tourists, oblivious to the village life just below yet worlds apart. In Nahuatl with choice of English, Spanish, or French subtitles, along with a transcription of the Nahuatl dialogue. DVD includes two PDF files with Nahuatl-English and Nahuatl-Spanish texts.